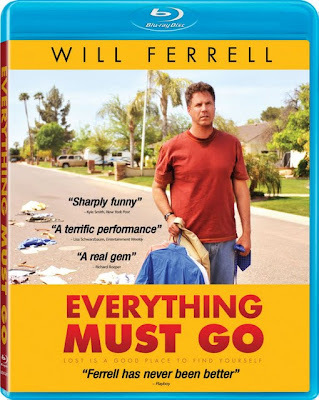 Though he describes his dad as “more of a drunk who did interesting things,” as we discover in writer/director Dan Rush’s indie feature Everything Must Go, salesman Nick Halsey (Will Ferrell) might just as well have been talking about himself. Only in Nick’s case, the interesting things have a way of happening to him involuntarily. And it’s a good thing that he doesn’t live in a place where precipitation is all that common because for Arizona resident Halsey, when it rains, it pours as he gets fired from his Regional Vice President position at a company he’d given sixteen years of his life to and then finds out his wife has not only left him but also changed the locks, leaving everything Nick Halsey owns on the front lawn. Out of options – not to mention nearly out of stuff – Nick realizes that to formally occupy his own lawn in the eyes of his community, he has to keep up the pretense of a sale for the sake of appearances. 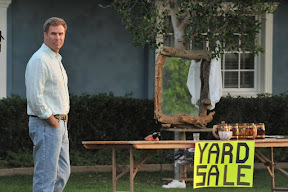 Setting up shop in his yard, he spends a bulk of the film trying to figure out what his next move should be – beyond whether or not to sell a half a bottle of mouthwash to a random yard sale wanderer. Whereas these decisions are made infinitely easier when he hires a neighbor kid to run his extremely disorganized sale alongside him in exchange for cigarette breaks he doesn’t use and baseball lessons, decisions about life and what’s next in the scheme of things continue to elude Nick. Bold in its simplicity, clarity and authenticity – shortcuts are thankfully nowhere to be found in Dan Rush’s understated work wherein life unfolds without contrivance or cliché. Although admittedly due to its very nature as a vignette and fact that the source material for the film came from the realm of short fiction, some big questions are left unanswered or articulated with much in the way of explanation. Yet while this may bother some viewers who require more closure or a firmer conclusion that will provide us with a better sense of what might be next for Nick or indeed even a greater understanding of what had occurred earlier for the man as well, ultimately in the case of this work, less is so much more. 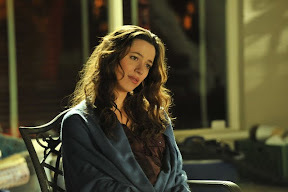 By giving us just enough to follow Nick from one point to the next, the film’s structure accurately reflects the plight of its existentially adrift lead as well as that of two other similarly struggling supporting players in the form of a new neighbor played by Rebecca Hall and Nick’s unlikely teen protégé (Christopher Wallace). Moreover, in doing so in a film that’s unpretentious, devoid of cynicism and generous to its characters – flaws and all -- Rush invites us to deduce the truth about all three individuals the way we would do with our own neighbors, piecing all the interesting things together ourselves. Knowing that anything goes upon the discovery that everything must go, Will Ferrell reminds us just how interesting playing it straight can be, letting go of his traditional “larger than life” onscreen persona to keep things real in Rush’s impressive debut.